Product Overview What’s up space ragers! The Transmisser is a modulated reverb with extra-long decay fed to a highly resonant filter. It is the sonic recreation of blowing your signal to bits, shooting it through a black hole then beaming it back down on a cloud of cosmic dust. It is a Blazar for musical instruments. If you can’t already tell, the Transmisser is not your every-day reverberation device. It does not do subtle. It does not do spring. It does not do a wood paneled rumpus room with 1" thick carpet. It will not recreate the classic sounds of the 60’s, 70’s and 80’s. 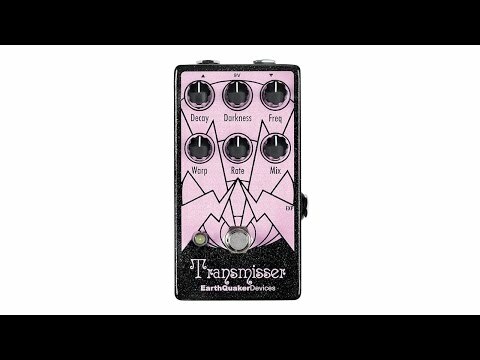 The Transmisser will create an ultimate soundscape-y backdrop to your all-night guitar freak-out. It’ll quickly turn you into a one note per minute knob twiddler. It’ll make you want to break out that dusty old expression pedal to do slow riding filter sweeps for days. • Darkness: This controls the tone of the reverberated signal; darker clockwise, lighter counterclockwise. • Freq: The controls the frequency of the resonant filter that processes the reverberated signal. Higher clockwise, lower counterclockwise. This can also be controlled by an expression pedal through the jack located on the Eastern side. Tip= Wiper, Ring= 3.3v and Sleeve= ground. We highly recommend the Moog brand of expression pedals because they know what’s up. • Warp: This is a system slew control. As you turn this control counterclockwise; the filter becomes deeper and more resonant, the decay becomes longer and warmer, the modulation grows wider and the whole system becomes more mellow. As you turn it clockwise, the whole system will tighten up and become more refined. • Rate: The Rate is hardwired for the optimum depth and controls the speed of the system-wide modulation in a narrow range that creates a sound far more unique than a simple modulated reverb. It is not only modulating the reverberation but also the Freq and Darkness within a small range that is dependent on where the Warp control is set. Faster clockwise and slower counterclockwise. • Mix: This is the reverb blend control. It adjusts how much wet signal is blended with your dry. More clockwise, less counterclockwise.